Richard A. Musgrave, one of the leading twentieth-century political economists, died January 15 at the age of 96. One of the great economists and thinkers of the post-war era, Richard Musgrave is credited as one of the true pioneers and scholars in modern public economics. His contributions to this field are immense, and include his seminal book “The Theory of Public Finance”, published in 1959 and a sine qua non for generations of economists. Musgrave was born in Königstein, Germany in 1910 and started his studies in economics at the University of Munich in 1930. One year later he moved to Heidelberg, where he graduated with a diploma (MA) in economics. In 1933, he left as a chosen scholar of the German Exchange Service to study at the University of Rochester, where he obtained another Master’s degree. He received his Ph.D. in economics from Harvard in 1937. He remained at Harvard until 1941 and then worked as an economist for the Federal Reserve Board in Washington, D.C., until 1948. From 1947 to 1981 he taught at some of the most prestigious U.S. universities, such as Johns Hopkins, Princeton, Harvard and Berkeley. During his career, Musgrave was repeatedly called on to provide economic advice to several US Administrations. He chaired commissions on foreign taxation and edited the renowned Quarterly Journal of Economics. Musgrave was also one of the pillars of the International Institute of Public Finance (IIPF), whose annual meetings he enriched, over many years, with thoughtful and fresh contributions. In 1978 the IIPF General Assembly elected him Honorary President. Later, a prize for young researchers was instituted in his and his wife’s name. He always kept a close link to his first alma mater, paying regular visits to the University of Munich, which in 2000 granted him an honorary doctorate. When the Center for Economic Studies (CES) was founded at that university, he was one of its most active supporters. 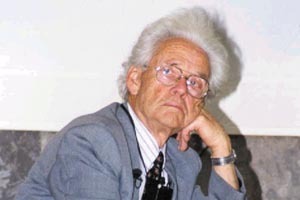 He was also instrumental in establishing the globe-spanning CESifo Economics Research Network, and served on the CES Scientific Advisory Council until his death. We are deeply indebted to him for his long-standing commitment and unwavering support for our endeavours.